An unfortunate reality of the Dark Souls PVP experience is running into hackers. Sometimes this means fighting foes with infinite health; in other case it means invisible, backstabbing bastards. Hackers have plagued Dark Souls from the start of the series, and they’re already up to no good in Dark Souls Remastered. Dark Souls Remastered released early on Steam last night, ahead of its full release on consoles this Friday. Eager players returned to the land of Lordran, excited to explore a familiar world or try out the series for the first time. A hacker going by the name “Malcolm Reynolds,” infamous throughout the Souls community, booted up the game to harass players using hacked magic spells to instantly kill them, drop nasty status effects, and break their equipment. Reynolds has a dreaded reputation within the Souls community thanks to a history of dangerous hacks. During Dark Souls 3’s height, he streamed himself defeating players with cheats, going so far as to claim he could modify code to get players “softbanned.” A softban marks the player as a cheater who can only play with other cheaters. Last night, Reynolds streamed his first foray into Dark Souls Remastered. The result was a horrifying beatdown of unsuspecting players. Adjusting the game’s code, Reynolds created a hellish fireball spell with numerous effects. The fireball did massive damage with a huge radius, which would already be bad enough for new players to deal with. However, it also had other effects. The spell afflicts Curse on the player, a debuff that lasts after death and reduces HP by half. It also adds the “Egghead” effect, a strange status that infects the player with a brain worm. Players with this status can’t wear helmets, and half of the souls they pick up are consumed by the egg. The only way to remove these statuses is to use special items that are difficult to obtain at the start of the game. For extra measure, Reynolds’ spell also broke his victim’s equipment. All he needed to do was invade games and toss his fireball in the vague direction of his target. 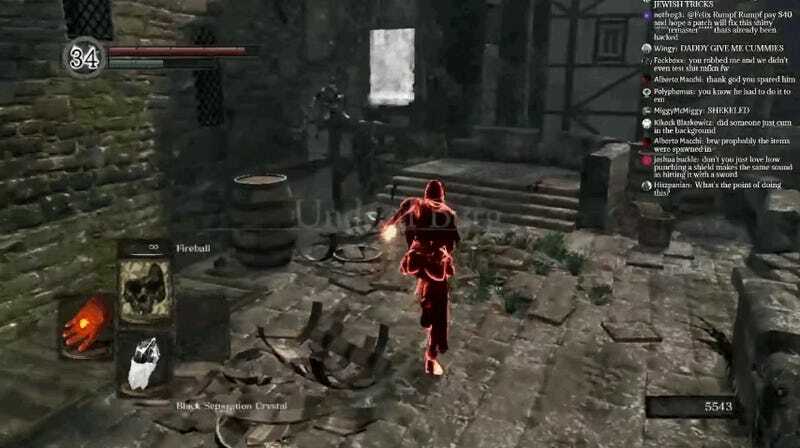 Dark Souls’ PC version had enough hackers that a popular mod was created called PVP Watch Dog that warned players if they were facing a known hacker. Following Reynolds’ stream, PVP Watch Dog creator eur0pa told the community that he had no plans to make a version for Dark Souls Remastered. “it’s been 6 years since Dark Souls came out, there have been 4 games on different engines, all of them sharing the same flaws, plagued with the same amount of cheaters and script kiddies, and all of them pulling off the same destructive actions: it’s time FromSoft fixed their own games without relying on the efforts of the community,” he wrote. Reynolds’ stream is an ominous sign for Dark Souls Remastered. The Dark Souls games’ anti-cheat measures are easy to abuse, allowing hackers to trick the game into banning legit players. In Dark Souls 3, it was as easy as dropping a hacked item for players to pick up. Mass bannings led Bandai Namco to tell my former colleague Patrick Klepek that some accounts might have been falsely flagged. Hackers might get banned, but they’ll likely do a lot of damage before they do.